Use the proper keyword & you will get more search engine traffic. Optimize your website/blog keyword & it would help you rank faster. How many times have you got such advice when you have started to learn about SEO? Keywords are the first thing that you should know & learn about when start to optimize your blog SEO. This guide is written for a beginner like you to understand the most fundamental concept of SEO & i.e. Keywords & their importance. Let’s start with the basics & if you have been blogging for a while, your 95% of traffic is coming from 5% of your posts. What I meant to say, you will be getting maximum search engine traffic on few hand-picked post of yours. Have you ever questioned why these posts are getting so much traffic? You must have done something right. The reason is, unknowingly some of your post are ranked on the first page for keywords that are highly searched by users globally or in a specific region of the world. The thing that you need to think here is, who is the one ranking your content? By the end of the day, it’s a machine language (Algorithm), which looks for certain signals to rank the content. When I say ranking of the content, what do I meant by ranking? In this context, it meant ranking for a specific keyword. Let me simplify the example for you. You can go to SEMRUSH site & type your blog address to see which keyword your blog posts/pages are ranking for. Try to understand the concept from the image. (Even if you don’t understand 100% of it at the first time, don’t worry as this is normal for a beginner). Keyword: This is the Keyword, which is driving traffic to a specific URL of my blog. (We also call it target keyword, or keyword one is trying to rank for). Pos. : Position of the keyword in Google search. Your target should be rank on the first page of the Google for your target keyword. Any words are qualified as a keyword when it has a considerable amount of searches (Search volume) in a month. Long tail keywords are more profitable as you will drive more targeted traffic & your chances of ranking on the first page are higher. More on this later, for now understanding the all the terms is more important. 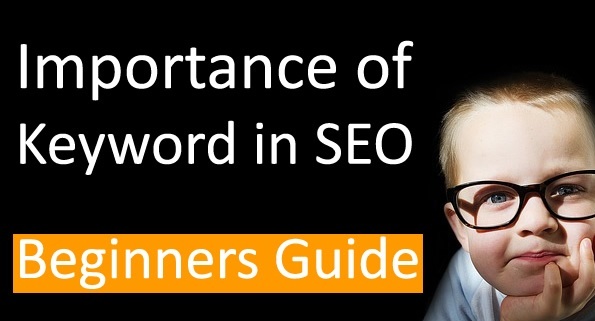 If you have missed something, it’s ok to go back & re-read the concept of Keywords in SEO. It’s true that writing quality posts will help you to drive traffic, but have you ever asked yourself why you are still not ranking in Google searches for any keyword, or why your quality posts stop getting traffic after some time has passed? 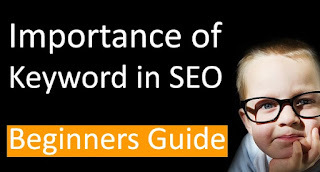 What is the importance of keywords from the perspective of SEO? If you have understood the basic concept of Keywords, now let’s dive into a little deeper into it. When we SEO optimize a blog post or a web page, we have the option to define our target keywords. This is most commonly known as Meta_keywords. Back until 2012, it was important to specify Meta_keywords (Keyword you are targeting), but in 2017, it’s not of any use. The search engine has become smarter to auto-detect keywords & rank your pages automatically. Google has already made it clear that they do not consider meta keywords when selecting keywords, and this makes sense because many bloggers who are new to blogging or article writing add lots of keywords in their posts. For example, one would write the following meta keywords for this post that you are reading: “keywords tips, SEO, keyword research”, and so on. Now ask yourself – would anyone who is searching for “keyword tips and tricks” want to see this article first? Personally, I would not like to rank for these keywords, because people will land here and then leave the blog. This will impact my bounce rate, and also my average time on site. Keyword research is the process of finding the right keyword in your niche. This step is important if you wish to grow your blog/website in a shorter span of time & make money. There are various ways by which you can find keywords & here I’m outlining few based on my preference. This is an online tool that let you find great keywords, or you can also put in URL of a website, & it would show all the keywords that website is ranking for. (See the 2nd screenshot of this article, which is taken using SEMRUSH). A good idea is to start by picking the top blogs in your niche & add it to see which Keyword those sites are ranking for. From here you just need to start building unique & high-quality content around those keywords. This is a paid tool but you can get 15 days free trial, which is worth $150 using this link. Ahrefs: This is an alternative to SEMRUSH which is also popular among SEO users. You can also use Google Search to find your target keyword, like this. Google auto suggest search query when you type anything, and it’s a good place to start the primary search. You can create a list of keywords using this technique & use SEMRUSh or Google keyword planner to check the search volume for all the keywords. Keyword density is a complex topic. This Wiki article will give you a fair idea of how keyword density is calculated. Depending on the target keywords, (long tail or short tail), you maintain a particular percentage of keyword density. When bots crawl your page, they can determine from the density that which particular keyword page should rank for. Keyword targeting is important but stay away from keyword “stuffing”, which is the overuse of keywords on a web page, as this will ultimately be harmful to your ranking. Different SEO ninjas have different ideas about keyword density, but your main keyword should not be more than 2% of the article length. I try to keep it between 1-1.5%, along with related search terms or that are known as LSI keywords. You can learn about LSI Keywords here & here is a free LSI keyword finder tool. Do remember, you can target more than one keyword on a blog post or a page. I would suggest don’t keep it more than three as; if your content is of high quality, you will rank for indirect long-term keywords. Stuffing your articles with keywords is never a good idea. Overuse of keywords alerts Google bots to the fact that you are “spamming” your post by stuffing it with unnecessary keywords. Google penalizes for this action, as spiders are alerted to the fact that you are trying to trick the system by using lots of keywords many times. This can affect your ranking. So be wise when you select the number of keywords you are using for SEO. Particularly since Google Panda, I highly recommend that you stop taking SEO actions that do not appear to be natural. If you are not sure about your SEO practices, use our free forum to ask a question. Now you have searched for a perfect keyword, and you are delivering it into a post or a page. Try also to use that keyword as part of the title of the post. One additional tip: Try not to use numbers in your permalink, because in the future if you want to extend the article by adding plugins or sites or additional information, your number will no longer make sense. Adding a relevant meta description will give more insight about your page to search engine bots. I suggest that you use your keyword in your meta title, meta description and meta keyword field along with an H1 tag. Also, try to write more SEO friendly articles by using H1, H2, and H3 tags. However, don’t overuse heading tags, as improper headings and too many H2 or H3 tags can lead to a negative ranking. Here is a post that I wrote as a guest blogger on another blog, using target keywords “Google Panda Penalty“. Read and analyze the post, and you will realize the extent of the on-page optimization I have done to make this post reach the number 1 position in Google. The article is very detailed, and I’m sure it will help you to learn to write better SEO optimized articles. Now that you are aware that keywords play an important role in SEO, your first task is to find 5-6 profitable keywords for your next post. You can use the Google Keyword Tool, SEMRUSH or any other online tool. Here is the updated list of best Keyword research tools. Write a post on your target keyword, and use any of these Google keywords rank tracker sites and keep track of your keyword positions. If you find the information useful, please share it with your friends and colleagues on Facebook, Twitter and Google Plus. How to design a website for mobile devices (smart phones). Next web world with smart phones so start working on mobile templates. In this post I want to explain very basic HTML design tip with adding a meta tag. Contains HTML code. CSS width style with percentage. width : 100% . Take a look at META tag viewport. Long days back I had posted an article Pagination with jQuery, MySQL and PHP with out refreshing page. Modified old script and added extra features like First, Previous, Next and Last buttons. Use it and enrich your web applications. My last post explained about New Twitter design basic layout with CSS and Jquery. In this post I want to explain how to expand URLs like new Twitter user interface using jquery, ajax and PHP. It is very easy just implementing with oembed jquery media plugin. Contains simple HTML and PHP code. In left class contains messages table records.